A 40-year-old lady caught my attention recently at the Moms of Kids with Disabilities Community of SHEROES. There is a 'we take pride in who we are' aura about her when she shares photographs of her 13-year-old son's achievements. A deeper dig into her SHEROES posts reveals that she is an inspiration to Moms having children with disabilities. Here's How Vinamrata takes pride in the latest Achievements of her Family! "Mahima, I was looking for such a platform where I can share my thoughts with my type of people through different communities. At SHEROES I can connect with moms of kids with disabilities as well as I can share my passion for art & crafts. Different communities in one place. Only women platform. And above all, a very empathetic platform," she informs about her experience at SHEROES...even before she talks about herself. Perhaps, that's her style...of keeping others before self? Vinamrata Bhatia who is based at Pune, Maharashtra. A Ph.D. in Biochemistry, Vinamrata is a mother to a 13-year-old boy and a six-year-old girl. Slowly Vinamrata starts opening up to my questions, "I had worked as a scientist in DST (Department of Science and Technology), as a Manager in a scientific cell of a Pharmaceutical company and in the Oncology department of a US-based drug landscaping and forecasting company. Then I worked as a volunteer teacher in a school for learning disabilities. Right now I am going to my son's school as his shadow and teaching there as a substitute." 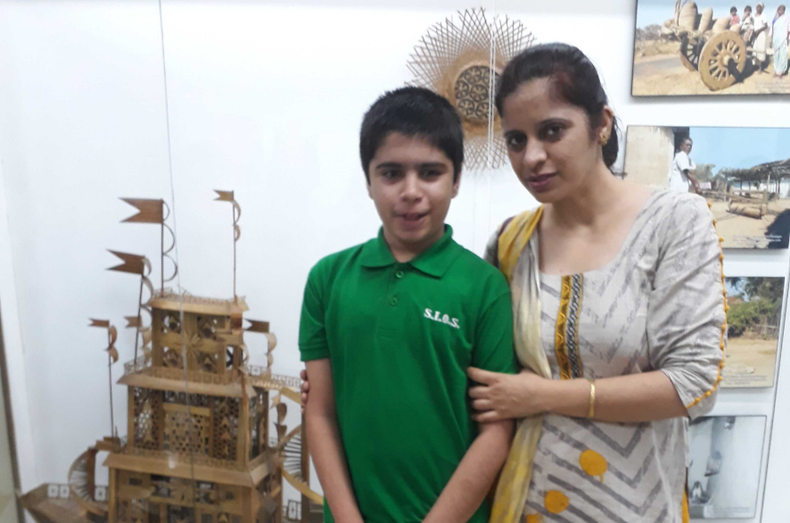 "Mahima, I have a 13-year-old autistic son. My son got diagnosed with Autism at the age of four. We faced so many problems related to his academics and therapies. There was a time when we changed 4 schools in one academic year. Thus, I can understand what parents having children with disabilities go through. Finally, I decided to homeschool my son and it was a great experience. It increased my bonding with my son and improved him a lot. Right now he is in the 7th grade at a special school in Pune," she details all this in a single breath! But the journey we all know must have not been easy. See How she shares with the world about the gifts of her son! She responds with a very calm, yet determined voice, "I attended so many workshops, wrote articles, got training for different therapies and special education. It had been a long journey of learning. I want to share my experiences and knowledge gained so far with other parents going through the same vicious circle. Talking about my son and his needs: Why should I shy from sharing my son's photographs? I feel proud of him. He has made us proud so many times. One recent event I want to share when he made a world record of zig-zag skating of the largest number of skaters in India." And a smile erupts on my face. Vinamrata, goes on to detail that the birth of her daughter also brought a great balance and joy in the family. "Birth of my daughter brought happiness and more strength to our lives. My son showed so much improvement after his sister's birth. Both brother and sister share a great bond, they are kind of inseparable. She is just six, but she takes care of him like a mother!" informs a very proud Vinamrata. And how did she ensure to sow just the-right-seeds of empathy in her daughter, who is actually too young to understand her responsibility as a sister? "Well Mahima, as parents we are always worried when it comes to our son. We are worried: who for him after us? I am bringing up my daughter to be patient and calm always....to make her understand the needs of her brother. She has begun understanding his needs; she takes great care of him as well as his friends whenever we are in a gathering at his school," informs Vinamrata. A strong mother, a strong woman, a strong human. But she says that there is also another aspect to her life, that has made her stronger and be able to take such life-long struggles in her stride. "Just a day before I was supposed to get engaged, I met with a major accident. An unknown person rushed me to the hospital as well as informed my parents. Urgent surgery was performed that included a steel-rod insertion in my leg, for me to be able to get back to my feet....but with an alert that there will be a FOREVER LIMP in my leg. While my family was happy that I escaped death, on the other hand, my fiance's family began making lame excuses so that the engagement could be called off. I was deeply hurt. And then something astonishingly beautiful happened. The stranger who had got me to the hospital proposed to me for marriage! My parents and I were amazed. And he didn't stop there, he immediately called his parents to the hospital and rings were exchanged right there! It was a day before my planned engagement was to happen!" Vinamrata becomes a little girl when she details this sort-of-fairy-tale that came alive in her life. So much joy she had while she spoke so highly of her soul-mate. So much pride. And the same pride reflects in her, while she weaves the life around her son. Vinamtara adds, "Now we are married for 14 years...full of love. He has supported me each and every moment of life. I no longer limp. We both do Yoga and Zumba together. And I believe the accident was just a Divine intervention to make me meet my soulmate." Vinamrata aims to someday open a school where life & social skills would be taught! While she is quite upbeat about life...and her children, she is also quite vocal and strong about certain things, that she says, are amiss from our society: "Right now there are insufficient sources of therapy centers and well-structured schools for differently-abled kids. The therapies must be made cost-effective. And also our society lacks awareness about people with disabilities. If we all can get together to eradicate these issues, the world will be a better place. A mother, a family will no longer struggle alone." "My only message is to be patient and keep working with your kids. One day you will definitely achieve results. Maintain a journal about your kid and note down milestones achieved and goals need to be achieved. Your child's achievements will keep you and his/her morale boosted. And the target-oriented approach would definitely help you to draw a timeline for your kid. I starting doing this when my son got diagnosed with Autism and I am still maintaining it. It helps me a lot in day-to-day life. And through it I am able to help other mothers too." If #HerStory has left you motivated, do share her story....and don't forget to share loads of love for her son and her in the comments column. Because he is such a brilliant child! You can follow Vinamrata at SHEROES. Feeling proud and encouraged as a parent after reading this...you are blessed to have him as a son and he will definitely become strongest person with all your praises and inspirations. Hats off Vinamrata.....God bless you, your son and your family. It needs courage and strength to go on with the flow. Thank you so much Dear sheroes. I am overwhelmed with this gesture. This is for every mom n family with super kids. Lots of love and my best regards. I feel good learning about you & your life Vinamrata because you come across as a take charge mom which is inspiring and eye opening. Shine on! Wow Vinamrata 👍 Your story on one hand is a fairytale and on the other it is so inspiring.. Lady hats off to you..and thanks Mahima for this inspiring story..
My Better Half Is A Better Mom As Well!